The persecution that broke out after the murder of Stephen is often cited as the occasion for John coming to Ephesus. Acts 8:1 says that the church was scattered throughout Judea and Samaria; however, the apostles remained in Jerusalem. There is no biblical evidence that John went to Ephesus in the 30s. A more likely scenario is that John, heeding Jesus' warning to flee Jerusalem when it was surrounded by Roman armies (Luke 21:20-21), moved with a community of Palestinian Jewish believers to Ephesus after the Jewish revolt broke out in 66 CE. Both Peter and Paul had recently been martyred in Rome under Nero, so John would have naturally filled their leadership vacuum. He ministered for some three decades to Christians in and around Ephesus, writing the Revelation, the Gospel and three Epistles. As the leader of the Asian church John was targeted by Roman authorities and exiled to Patmos (Rev. 1:9). While on the island John received his apocalyptic vision about the spiritual situation of seven Asian churches as well as about the future of the church and the world (1:10-11, 19). The order of the seven churches - Ephesus, Smyrna, Pergamum, Thyatira, Sardis, Philadelphia, and Laodicea - follows a route that a messenger would naturally follow in visiting the cities. 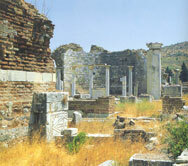 During Paul's ministry in Ephesus many churches were established in Asia. Hence these seven churches seem to represent many other churches that were in Asia at the time (e.g., Miletus, Troas, Assos, Cyzicus, Magnesia, Tralles, Metropolis, etc.). The style of the seven messages is similar, with the heart of each focused on commendation and correction concluding with a promise of victory. The historical and spiritual situation of each church aids in interpreting the details of its message. The addressees of the book of Revelation were seven churches in the Roman province of Asia. W. M. Ramsay states that the province "embraced the W. parts of the great peninsula now called Asia Minor, including the countries Mysia, Lydia, Caria, and great part of Phrygia, with the Dorian, Ionian, and Aeolian coast-cities, the Troad, and the islands off the coast (Lesbos, Chios, Samos, Patmos, Cos, etc.)" ("Asia", Hastings Dictionary of the Bible, 1.171). Why these churches were singled out over other churches in the area has been an ongoing topic of discussion. The result of Paul's 2 1/3 year residence in Ephesus (a.d. 52-54) was that "all the Jews and Greeks who lived in the province of Asia heard the word of the Lord" (Acts 19:10). Such widespread dissemination of the gospel thus occurred some two decades (early dating c. 69) or four decades (late dating c. 95) before Revelation was written. Six other sites are certain locations of churches in the first century: Troas (Acts 16:8-11; 20:5-12; 2 Cor. 2:12; 2 Tim. 4:13), Miletus (Acts 20:15, 17; 2 Tim. 4:20), Colossae (Col. 1:2), Hieropolis (Col. 4:13), Tralles and Magnesia (Ignatius). Richard Oster has listed 37 Anatolian cities where Christian communities were established in the first and second centuries. None of the cities that follow are on his list, although he acknowledges that because such books as Revelation were designed as circular letters, this increases "the number of Christian sites that can be inferred from early Christian literature" ("Christianity in Asia Minor", Anchor Bible Dictionary, 1.938). Other possible sites include Assos, which was approximately twenty miles overland from Troas via a Roman road, Mitylene, Chios, and Samos (Acts 20:13-15). Priene was an important Greek city along the route between Miletus and Ephesus, and Cyzicus was the most important Asian seaport on the Propontis (Sea of Marmara). The late E. M. Blaiklock suggested that Aphrodisias "will probably soon be added to the list of Ten Towns of Asia known to have been first-century centers of Christian witness" (NIDBA [ed. E. M. Blaiklock; Grand Rapids: Zondervan, 1983] 31). In a personal letter responding to my question regarding the source of that assertion, Edwin Yamauchi wrote: "As I am not aware of any first-century evidence for Christians at Aphrodisias (and think it highly unlikely), I suspect that Dr. Blaiklock was probably guessing when he wrote on Aphrodisias" (May 3, 1992). The excavator of Aphrodisias, the late Kenan T. Erim, wrote: "The earliest known name of an Aphrodisian bishop is that of Ammonius, who participated in the Council of Nicaea in 325. Two early Christian martyrs, apparently put to death under Diocletian, were also ascribed to the city" (Aphrodisias: City of Venus Aphrodite [New York: Facts on File, 1986] 33). Given the prominence of Aphrodisias (re Augustus' statement: "Aphrodisias is the one city from all of Asia I have selected to be my own" [ibid., 1]) and its proximity to the three churches of the Lycus valley, undoubtedly the gospel was preached there at an early date. No historical evidence has yet been discovered to verify the existence of a first- century church there, however. Several of these cities are more prominent than Thyatira and Philadelphia. W. M. Ramsay has convincingly suggested that the order of the churches in Revelation represented a circular postal circuit that a courier would follow. Thus these churches were primary communication centers contentrom which secondary messengers would be dispatched so that other churches in their respective districts could read the correspondence. Revelation, then, was meant for a larger audience than the designated churches. But I want to return to two more basic questions: why just seven churches? And of these seven churches, why begin with Ephesus?